I figured that while I was in Seattle I should definitely get some sort of brunch going. Considering I don’t make it out for breakfast much these days I made an effort to try a couple of places while I was around. I went to roux; it was a wood grain restaurant with a pension for bourbon and the south mid-west. 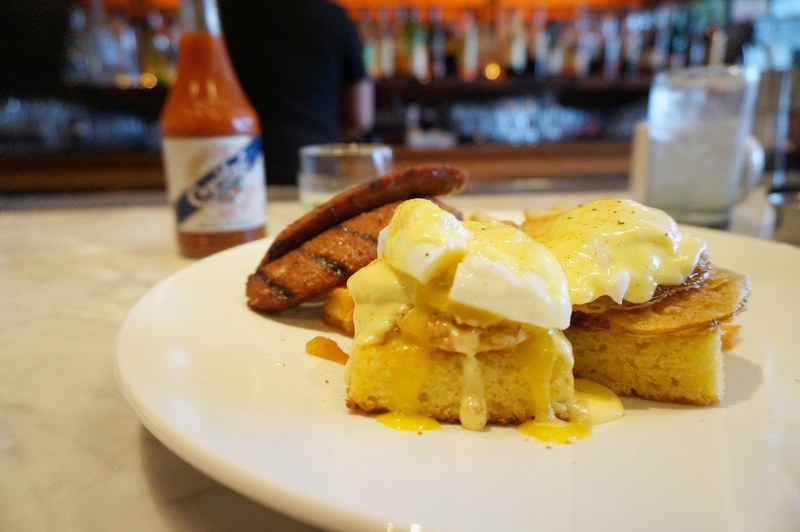 It was reflected in their food menu; I decided to try their fried green tomato eggs benedict with andaloiuse sausage. The green tomato was crumbed and deep fried and sat underneath a perfectly poached egg. All topped with a southern inspired hollandaise. In keeping with the southern theme they’d opted out of the normal muffins or bread it was served on fluffy corn bread. As a whole the dish was good I liked the sausage with the dish; the corn bread was a nice touch and the hot sauce on the table made for a great addition. Overall the brunch was good but not mind blowing. Posted on May 21, 2016 by AdrielPosted in Brunch n Lunch, Seattle, United StatesTagged Brunch, eggs benedict, Seattle.